This is a tank with a dripping atomizer running through the center. 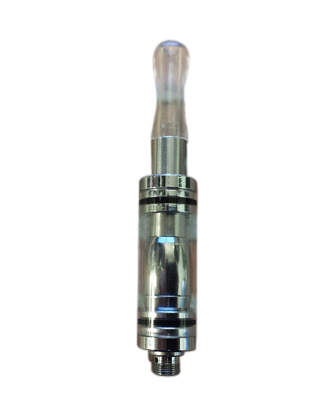 It is a unique design because you get the bold clean hit of an atomizer but in a tank so you can vape for most of the day without refilling. The Terminator produces tons of vapor and seems to keep up even if you "hot box" it. The atomizer portion, when removed from the tank, unscrews apart to reveal the 2.4 ohm coil. There is a hole drilled at the bottom for airflow which can be adjusted by sliding the tube up or down to cover or uncover the hole. The atomizer unscrews at the center of the bulb if you want to replace just the coil with your own. This is great for DIYers. There is also a hole drilled in the threads of the bulb to allow for e-liquid to wick to the coil. By leaving this unscrewed a bit, there is greater e-liquid flow to the coil. The wider you open it the more e-liquid there is. By shutting the bulb completely, it is set to be used as a dripping atomizer. The Terminator has a 510 unsealed connector for airflow and comes with a 510 drip tip installed. Carefully remove the top cap of the tank. Put 25-30 drops of e_Liquid into the tank. Replace the cap of tank. Put 4-5 drops down the center of the atomizer to prime. Put any 510 drip tip on the top of the atomizer. Screw unit onto your mod or battery.